What a mess. Add up ugly facts and a court that bought a frivolous and completely wrong argument (made without citation – because there aren’t any) and you end up with a fiasco. Here’s to appeals. Non-party Herb Burkhalter had a yellow pages directory business he sold to co-defendants Steven M. Brandeberry and American Telephone Directories Inc. in 1994. Bradeberry and the company were jointly listed as “Purchaser” in the agreement. The agreement transferred customer lists, sales records, and the goodwill of the business. All the assets of the business were to return to Burkhalter if the Purchaser defaulted. The unregistered “distinctive name, insignia and logo, entitled ‘AM/TEL'” was not immediately assigned, but rather was licensed to the Purchaser until the amounts due under the asset purchase agreement and trademark license were paid in full. Brandeberry and American Telephone Directories paid everything in full and therefore became the owners of the trademark. 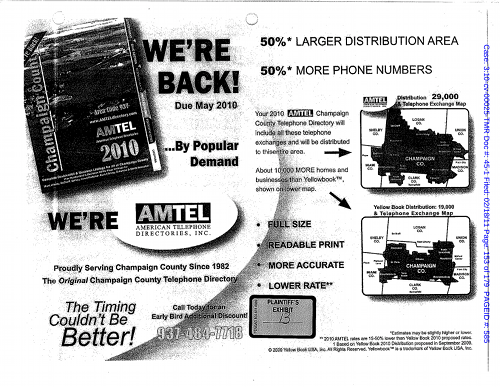 The agreement was signed for “Amtel Directories, Inc.” by Brandeberry. Yellow Book sued him for trademark infringement and related claims. It’s not an unreasonable position that the assignment of the mark was originally to two joint owners, American Telephone Directories and Brandeberry. I maintain that further investigation into whether indeed the trademark was owned by one or both was merited; looking at various factors relating to trademark ownership might disclose that over the course of time one or the other was actually controlling the quality of the goods and services and was the true owner. Brandeberry asserts that abandonment of a trademark by an owner can cause the owner to lose his right to sue a new user for infringement, but it does not deprive the owner of the right to use. However, Brandeberry has cited no caselaw in support of this assertion and the Court is unable to find any. Courts have determined that trademark rights derive from the use of the trademark in commerce and not from the registration of the mark. Sands, Taylor & Wood Co. v. The Quaker Oats Co., 978 F.2d 947, 954 (7th Cir.1992). Further, the owner of a mark will lose the exclusive use of a mark if the owner fails to actually use the mark. Id. at 954-55. But it is not Brandeberry, in this case, who is claiming exclusive use of the AM/TEL name, marks and related assets. It is Yellow Book. Further, courts treat the abandonment of a trademark as a defense to an infringement claim. See Saxlehner v. Eisner & Mendelson Co., 179 U.S. 19, 31 (1900). And, again, it is not Brandeberry who has brought the infringement claim in this case. Abandonment is not Brandeberry’s defense. 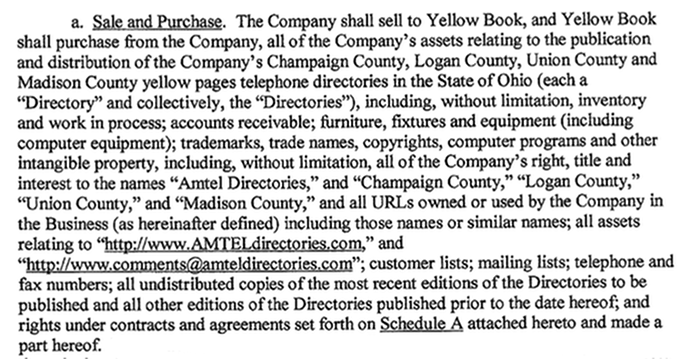 Thus, while Yellow Book’s argument that it is entitled to exclusive use of the AM/TEL name, marks and related assets because Brandeberry has abandoned the use of AM/TEL, may be relevant as a defense to a trademark lawsuit brought by Brandeberry, it is not relevant to a lawsuit that Yellow Book has brought. 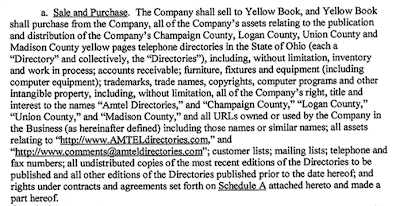 Yellow Book is not entitled to exclusive use of the AM/TEL name, marks and related assets because Brandeberry is also entitled to the use of these same AM/TEL names, marks and related assets. No. No. While abandonment often comes up as a defense to trademark infringement, abandonment is a loss of all rights entirely, for every purpose. The court said it was “unable to find any” case law – did the court not have a copy of Callman’s? Abandonment is “in nature a forfeiture.” It destroys the trademark; it involves the “loss not only of the right to exclude others but also of the … right to use the name in trade.” The mark does not revert back to the assignor of the one who abandoned it; that assignor is in no better position than any other member of the public. . . .
Once a mark has been abandoned, “any other person has the right to seize upon it immediately … and thus acquire a right superior, not only to the right of the original user, but of all the world.” . . . The issue of ownership after abandonment should be considered without reference to the prior ownership, whether the mark is thereafter appropriated by a stranger, or re-appropriated by the prior owner or the assignee of the prior owner. Thus, priority goes back only to the time the prior owner or his assignee re-appropriates the mark. Resumption after abandonment does not reinstate the abandoned rights. Therefore the rights of an intervening user are superior to those of a previous owner who abandoned and then resumed. A party cannot claim that use subsequent to abandonment of a mark has revived the rights obtained by the earlier use. The Court of Appeals for the Eleventh Circuit has held that where a party did not use the mark for 48 years from 1932 until 1980, its use in 1980 did not retroactively cure its past abandonment. Rights lost as a result of abandonment are not revived by such subsequent use. Once a period of nonuse results in abandonment, a resumption of use thereafter cannot cure the preceding abandonment. Such a resumption represents a new and separate use with a new date of first use. 3 McCarthy on Trademarks and Unfair Competition § 17:3 (4th ed.). Once the court found that Brandeberry was entitled to use the mark, Yellow Book’s likelihood of confusion claim failed. In this case, as determined above, Brandeberry has not given up his right to use the AM/TEL name, marks and related assets. Thus, Yellow Book cannot show that it is entitled to protection of the AM/TEL name, marks and related assets from their use by Brandeberry. Oh, where do I start? Of course Brandeberry abandoned the mark, he sold the company and stopped using the name because he fully intended that the business, including the trademark, be completely transferred. Further, the court clearly has no concept of what a trademark is, that is, a SOLE source identifier. It is simply not a divisible asset. To allow two unrelated parties to use the same mark for the same goods in the same territory without one controlling the other is the very situation that trademark law is meant to prevent. The court’s conclusion is therefore necessarily wrong – whether because the mark was indeed fully assigned, or because Brandeberry abandoned it, but the outcome is entirely inconsistent with legal theory and policy. Yellow Book, please appeal. Is there a claim for breach of warranty? I say not – the Company was only selling whatever “right, title and interest” it had and warranted that it had valid title to only that – it didn’t warrant that it owned exclusive rights to the transferred assets. This is a quitclaim, not a warranty deed. Check the indemnification clause yourself, but I don’t see any separate IP indemnification. I think the only claim is for breach of warranty, which isn’t going to work. Let me know if you think I’m wrong. Yellow Book USA Inc. v. Brandeberry, No. 3:10-CV-025 (S.D. Ohio May 3, 2011).